The variability of leaf margin serration of Populus nigra L. in conditions of industrial dumps (coal mines dumps and overburden dumps) and city park is estimated. The value of this indicator is in the range from 1.25 to 1.76 and significantly increases along the gradient: coal mines dumps – overburden dumps – city park. From the number of selected gradations of P. nigra leaf blades, the gradation with values of 1.45-1.55 is most pronounced according to the analyzed index for industrial dumps, for the park – with the values of 1.55-1.65. The degree of serration of edge leaf blade is characterized by low values of variation – coefficient of variation is less than 10.0%. We registered the significant positive correlation between the average values of leaf margin serration and the length of P. nigra leaf blade. Adams, J.M., Green, W.A., Zhang, Y. (2008). Leaf margins and temperature in the North American flora: Recalibrating the paleoclimatic thermometer. Global and Planetary Change, 60, 523–534. Andreeva, M.V. (2007). Assessment of the state of the environment in plantations in zones of industrial emissions with the help of plant–indicators. St. Petersburg (in Russian). Bailey, I.W., Sinnott, E.W. (1916). The climatic distribution of certain types of angiosperm leaves. American Journal of Botany, 3, 24–39. Baker–Brosh, K.F., Peet, R.K. (1997). The ecological significance of lobed and toothed leaves intemperate forest trees. Ecology, 78(4), 1250–1255. Bessonova, N.V. (2009). Use of the bioindication method for assessing the ecological status of various regions in Khabarovsk. Forests of Russia in the 21st Century. St. Petersburg, 11–13 (in Russian). Brown, V., & Lawton, J. (1991). Herbivory and the evolution of leaf size and shape. Philosophical Transactions of the Royal Society of London, B, Biological Sciences, 333, 265–272. Bukharina, I.L., Povarnitsina, Т.М., Vedernikov, K.E. (2007). Ecological and biological features of woody plants in an urbanized environment. Izhevsk (in Russian). Couturier, E., Brunel, N., Douady, S., Nakayama, N. (2012). Abaxial growth and steric constraints guide leaf folding and shape in Acer pseudoplatanus. American Journal of Botany, 99, 1289–1299. Dolph, G. (1979). Variation in leaf margin with respect to climate in Costa Rica. Bull. Torrey Bot. Club, 106, 104–109. Edwards, E.J., Chatelet, D.S., Spriggs, E.L., Johnson, E.S., Schlutius, C., Donoghue, M.J. (2017). Correlation, causation, and the evolution of leaf teeth: A reply to Givnish and Kriebel. American Journal of Botany, 104(4), 509–515. Edwards, E.J., Spriggs, E.L., Chatelet, D.S., Donoghue, M.J. (2016). Unpacking a century–old mystery: Winter buds and the latitudinal gradient in leaf form. American Journal of Botany, 103(6), 975–978. Feild, T.S., Sage, T.L., Czerniak, C., Iles, W.J.D. (2005). Hydathodal leaf teeth of Chloranthus japonicus (Chloranthaceae) prevent guttation–induced flooding of the mesophyll. Plant, Cell & Environment, 28, 1179–1190. Gates, D.M. (1968). Energy exchange and ecology. Bioscience, 18, 90–95. Givnish, T.J. (1978). Ecological aspects of plant morphology: Leaf form in relation to environment. Acta Biotheoretica (Supplement: Folia Biotheoretica N 7), 27, 83–142. Givnish, T.J. (1979). On the adaptive significance of leaf form. In Solbrig, O.T., Raven, P.H., Jain, S., & Johnson, G. Topics in plant population biology. New York, Columbia University Press, 375–407. Givnish, T.J. (1984). Leaf and canopy adaptations in tropical forests. Physiological ecology of plants of the wet tropics, 51–84. Givnish, T.J., Kriebel, R. (2017). Causes of ecological gradients in leaf margin entirety: Evaluating the roles of biomechanics, hydraulics, vein geometry, and bud packing. American Journal of Botany, 104, 354–366. Gottschlich, D.E., Smith, A.P. (1982). Convective heat transfer characteristics of toothed leaves. Oecologia, 53 (3), 418–420. Hinojosa, L.F., Pérez, F., Gaxiola, A., Sandoval, I. (2011). Historical and phylogenetic constraints on the incidence of entire leaf margins: Insights from a new South American model. Global Ecology and Biogeography, 20, 380–390. Isakov, V.N., Viskovatov, L.I., Leishovnik, Ya.Ya. (1984). Investigation of leaf morphology by means of automation. Riga (in Russian). Khuzina, G.R. (2010). Influence of the urban boundary on the morphometric parameters of the birch leaf layer (Betula pendula Roth). Bulletin of the Udmurt University. Biology, 3, 53–57(in Russian). Lakin, G.F. (1990). Biometrics. Moscow (in Russian). Migalina, S.V., Ivanova, L.A., Makhnev, A.K. (2009). Dimensions of the birch leaf as an indicator of its productivity far from the climatic optimum. Physiology of Plants, 56, 6, 948–953(in Russian). Niinemets, Ü., Kull, O., Tenhunen, J.D. (1999). Variability in leaf morphology and chemical composition as a function of canopy light environment in coexisting deciduous trees. International Journal of Plant Sciences, 160, 837–848. Niinemets, Ü., Portsmuth, A., Tobias, M. (2007). Leaf shape and venation pattern alter the support investments within leaf lamina in temperate species: a neglected source of leaf physiological differentiation. Funct. Ecol., 21, 28–40. Nizhegorodtsev, A.A. (2010). Pseudosymmetry of plant objects as a bioindication indicator: theoretical justification, evaluation automation, approbation. Nizhny Novgorod (in Russian). Polyakov, A.K. (2009). Introduction of woody plants in the conditions of anthropogenic environment. Donetsk (in Russian). Royer, D.L., Kooyman, R.M., Little, S.A., Wilf, P. (2009). Ecology of leaf teeth: A multi–site analysis from an Australian subtropical rainforest. American Journal of Botany, 96, 738–750. Royer, D.L., Peppe, D.J., Wheeler, E.A., Niinemets, Ü. (2012). Roles of climate and functional traits in controlling toothed vs. untoothed leaf margins. American Journal of Botany, 99, 915–922. Royer, D.L., Wilf, P. (2006). Why do toothed leaves correlate with cold climates? Gas exchange at leaf margins provides new insights into a classic paleotemperature proxy. 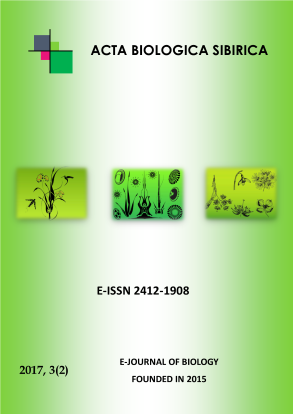 International Journal of Plant Sciences, 167, 11–18. Shtirts, Yu.A., Shtirts, A.D. (2004). Consortive connections of birds with wood autotrophs in conditions of the urbanized landscape of Donbass. Bulletin of Donetsk University. Natural science, 1(2), 411–416 (in Russian). Shtirts, Yu.A. (2011). Variation in the size of the leaf blade of Acer pseudoplatanus L. in conditions of roadside ecosystems of the city of Donetsk. Regulation of growth, development and productivity of plants. Minsk, 228 (in Russian). Shtirts, Yu.A. (2012a). Variation of the dimensions of the leaf blade of the Роpulus nigra L. in conditions of industrial dumps in the Donetsk region. Biological recultivation and monitoring of disturbed lands. Ekaterinburg, 305–310 (in Russian). Shtirts, Yu.A. (2012b). Assessment of the variability of the apex and the base of the leaf blade of Роpulus nigra L. in conditions of industrial dumps. Industrial botany, 12, 31–36 (in Russian). Smirnova, O.V., Zaugolnova, L.B., Taronova, N.A., Falikov, L.D. (1976). Criteria for distinguishing age conditions and features of the ontogenesis course in plants of different biomorphs. Moscow, I, 14–43 (in Russian). Stakovetskaya, O.K., Kulikova, N.A., Sovetova, E.S. (2012). Estimation of the ecological state of the air environment using bioindication methods. Available at http://www.rusnauka.com/10_DN_2012/Ecologia/6_106476.doc.htm/ Accesed on 15.05.2017 (in Russian). Vogel, S. (2009). Leaves in the lowest and highest winds: temperature, force and shape. New Phytologist, 183, 13–26. Wilf, P. (1997). When are leaves good thermometers? A new case for leaf margin analysis. Paleobiology, 23, 373–390. Wolfe, J.A. (1971). Tertiary climatic fluctuations and methods of analysis of tertiary floras. Palaeogeography, Palaeoclimatology, Palaeoecology, 9, 27–57. Wolfe, J.A. (1993). A method of obtaining climatic parameters from leaf assemblages. US Geol. Surv. Bull., 2040, 1–71. Zaitseva, I.O. (2012). Bioecological mechanisms of wood introductions adaptation in the steppe zone of Ukraine. Dnepropetrovsk (in Ukrainian). Zakharov, V.M., Baranov, A.S., Borisov, V.I., (2000). Health of the environment: a methodology for evaluation. Assessment of the state of natural populations for the stability of development: methodological guidance for reserves. Moscow (in Russian). Zhukov, A.V., Shtirts, Yu.A., Zhukov, S.P. (2011). Evaluation of morphological variability of Betula pendula Roth leaflets in ecosystems with different degree of anthropogenic transformation by methods of geometric morphometry. Problems of ecology and nature protection of the technogenic region, 1(11), 128–134 (in Russian). Zhukov, S.P. (2011). Plants resistant to high acidity of soils in phytocenoses of Donbass dumps. Problems of ecology and nature protection of the technogenic region, 1(11), 230–234 (in Russian).